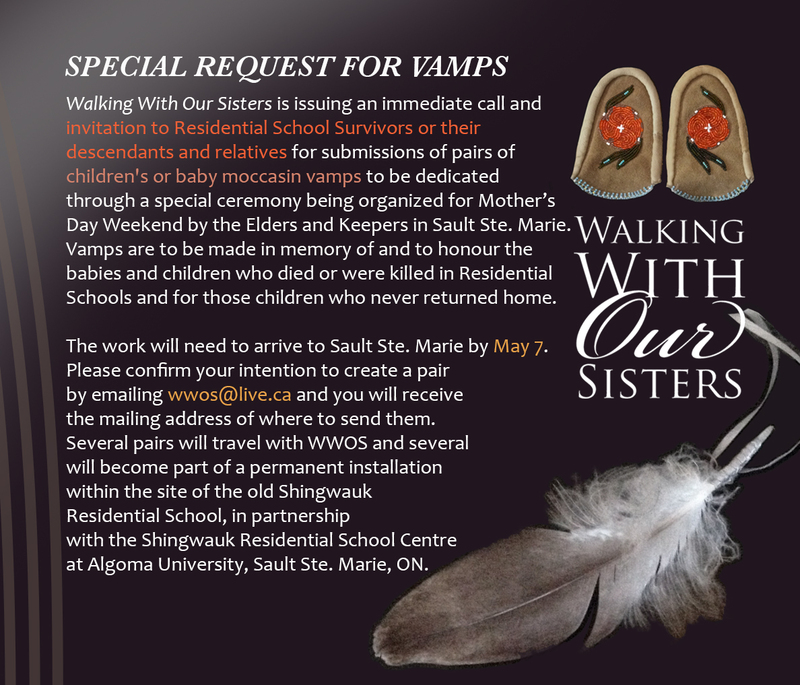 Walking With Our Sisters is issuing an immediate call and invitation to Residential School Survivors or their descendants and relatives for submissions of pairs of children’s or baby moccasin vamps to be dedicated through a special ceremony being organized for Mother’s Day Weekend by the Elders and Keepers in Sault Ste. Marie. Vamps are to be made in memory of and to honour the babies and children who died or were killed in Residential Schools and for those children who never returned home. Walking With Our Sisters’ 5th exhibit will take place at Algoma University in Sault Ste. Marie from May 5 to May 18, 2014. Significantly, the site for Walking With Our Sisters in Sault Ste. Marie is located in the old Shingwauk Residential School building, now the site of Algoma University, Shingwauk Kinoomaage Gamig, and The Shingwauk Residential Schools Centre (SRSC) at Algoma University, which is a joint initiative with the Children of Shingwauk Alumni Association. In an effort towards healing, these children’s vamps will be feasted into the “bundle” with a special ceremony to acknowledge the loss of lives in the schools, and the grief the families endured from the losses of their children. The ceremony is tentatively scheduled to take place on Mother’s Day – Sunday May 11, 2014. All are welcome to attend the ceremony. The work will need to arrive to Sault Ste. Marie by May 7. Please confirm your intention to create a pair by emailing wwos@live.ca. Several pairs will travel with WWOS and several will become part of a permanent installation within the site of the old Shingwauk Residential School, in partnership with the Shingwauk Residential School Centre at Algoma University, Sault Ste. Marie, ON. Note: This call is open to Survivors or relatives on both sides of the border, USA or Canadian.